Fjällräven's first duffel bag, Sailor Bag 214, was released in 1973 and Duffel No. 4 has been developed in the same spirit with versatile functions and a classic, clean design. 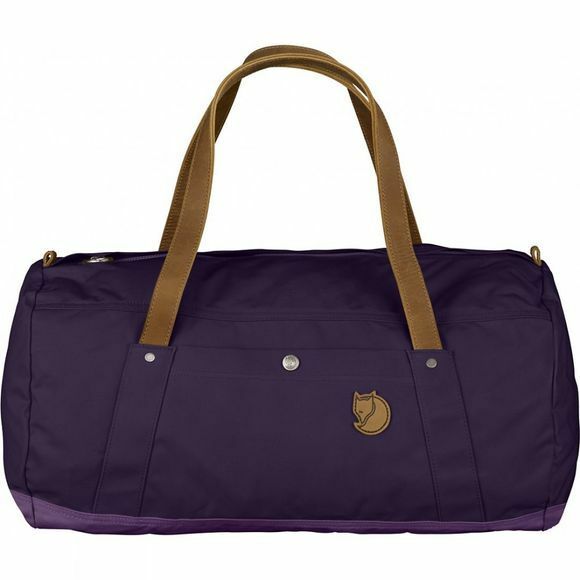 The bag is perfect both for short weekend trips and for carrying your work-out clothing on a daily basis. A large zipped main opening with an easy-to-grip pull makes it easy to pack and unpack, and an inner safety pocket holds small items. Two outer pockets, one zipped and one with a push button, and double layers of fabric on the bottom for reinforcement. The straps are designed so they can be carried in the hand, on the shoulder or across the back. The strong, waxed G-1000 HD fabric and leather straps mean that this bag will stay with you for years and become more attractive the older it gets. For over 50 years Fjällräven has had a strong driving force, to develop products that make it easier for people to enjoy the countryside. Their functional, durable and timeless designs sets Fjällräven apart from their competition. The company is best known for its durable and adaptable G-1000 fabric found in many of their products. Åke Nordin may not have known that he was creating an international company when he turned his passion of creating backpacks into Fjällräven, back in 1960, but since then Fjällräven’s products has sold in over 20 countries. Since its Örnsköldsvik beginnings, Fjällräven has continued to produce innovative, functional products which are appreciated by generations of outdoor enthusiasts across the world and which have also received a number of distinguished awards over the years. From its very first innovative framed backpacks and lightweight outdoor jackets, Fjӓllrӓven has stayed true to its original mission, not only through the products they produce but their stance on protecting the environment that they draw their inspiration from. Fjӓllrӓven is always looking for new ways to reduce its environmental impact; from its innovative, PFC-free Eco-Shell fabric to its highly ethical and fully traceable Down-sourcing programme.